Special Report by Science Editor Round A.Bout. Reprinted with the permission of GreyTownGazette.com. "Tell Me a Story About Chuck Norris." We’ve just returned from another successful World Drinking Tour Excursion, and while I’m sure there is much more to write about the entire experience I felt it important to get this one little detail down as quickly as possible. Skippy and I were at the Delerium Café enjoying a beverage or two at an outside table in the alley. There were several empty chairs around us and, as often happens, random strangers would plop down at the table, exchange pleasantries, and then move on. But one gentleman in a particular seemed to be on a mission.He was from Switzerland, but that’s not his fault. We didn’t get his name, or if we did, it was something like Wicky, or Zubriggen or Donders … but no matter. We’ll call him Montreaux (Monty for short). Monty plopped into a chair across from us and introduced himself. We did the same. Everyone was smiles and sunshine and drunkeness and laughter. But then, Monty turned serious.”Tell me a story about Chuck Norris.” he said to me, his eyes filled with a strange longing. Devastating news out of Belgium today as Belgian Beer Association president Monsieur Lapin Drole declared the 2010 Belgian Hop Harvest a complete and total loss. “Devastation of this magnitude is unprecedented. The Belgian Beer industry can never recover,” sobbed Monsieur Lapin at a hastily arranged press conference on Tuesday. While scientific authorities have not yet released their report on the massive crop failure, Belgian Beer Blogs are reporting that the following image is to blame. The photo clearly shows an unidentified Sasquatch type creature running naked through the hop fields of Belgium. And once this photo has been seen, it cannot be unseen. Try as you might, and oh yes, you will try, but it will haunt you for the rest of your days. A special report reprinted through the courtesy of The Grey Town Gazette. The European Union is to introduce legislation officially recognizing beer drinkers as an Ethnic Group. The decision was made by a group of influential MEPs as they participated in an intensive 3-day field study at the 2009 Brussels Beer Festival. The move means that Beer Drinkers will have similar rights to religious groups. No, Not the Crock Pot! Many moons have passed since the completion of the 2006 World Drinking Tour and not one single post? Is it shame that keeps the faithful from imparting their tales? Perhaps … but as one without shame, allow me to cast the first stone. It was rendezvous day. The day that our Belgium contingent would board their train and join Steve and myself in Amsterdam. 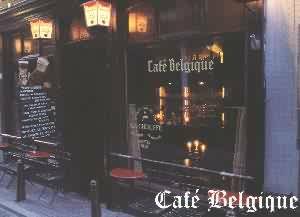 The plan was to meet at 7:30 (pm) at the Café Belgique and then … game on. Me and Steve? Well, we’d been in Amsterdam for a few days already and were starting to feel the effects of having done very bad things … lightly peppered with the pain that comes from knowing you still have bad things left to do. We had awakened – or better yet – “come to” at about 2pm and were walking to get some coffee. We were far too traumatized for a scone but secure in the knowledge that we’d bounce back by 7:30 and be ready to drink anew. Pizza in Cans. No, I’m not talking about the dream that the frustrated and misunderstood genius Chef Boyardee took with him to his grave. But maybe that is what I should be talking about. Because not enough people know the story of Chef Boyardee, a dreamer, a genious with a brain so large that he became a chef after a visit to a chapeau shop, only to find that there were no hats big enough to fit his grossly enlarged cranium.